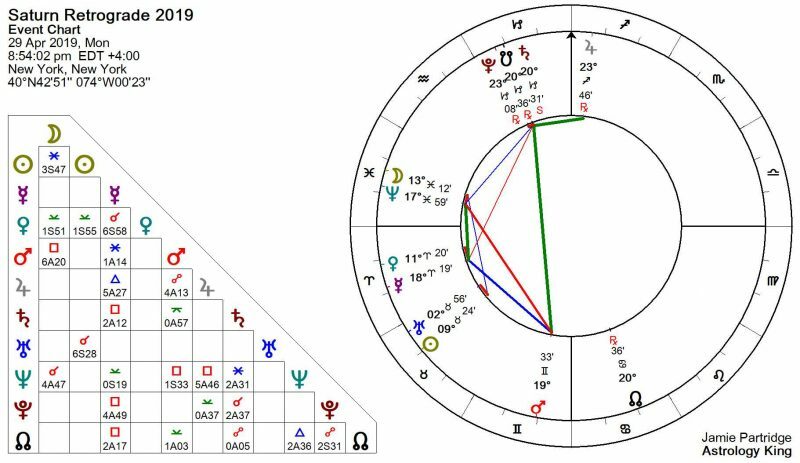 Saturn Retrograde 2019 starts on April 25 at 20° Capricorn and ends on September 18 at 13° Capricorn. Saturn is the Lord of Karma. Retrograde motion is a time when karma is sorted out. Therefore, Saturn retrograde is a double dose of karma. Karma is a form of energy that is very real. Like Saturn, it is very closely bound to time. Past, present, and future blur into one. If you have been bad in the past, then at a certain predestined time, an event will occur to teach you a lesson. If you been good in the past, then at a predestined time, an event will occur to reward you for your good deeds. With Saturn in retrograde motion, the karma will relate to how responsible you have been in the past. The lessons associated with Saturn retrograde 2019 relate to your thoughts and words. It will be especially challenging if you have a history of teasing or verbally abusing people. Pessimism and indecision make this a difficult time for making important decisions. Saturn direct 2019 brings a much brighter outlook, especially for making important decisions about your home, family and relationships. This could be a major positive transformation in your life. Before more detail about Saturn retrograde 2019 you will find information on the meaning of Saturn retrograde natal and transit. Saturn retrograde natal suggests there was a problem with self-discipline or avoiding responsibility in a former life. Due to illness, immaturity or disrespect, you may have neglected looking after your loved ones. Perhaps you failed to earn a living to support your parents, or ran out on your partner and children. There will be some lessons or extra effort required this life to pay back this karmic debt. You must learn the lessons so you don’t have to go through this difficult cycle again. Saturn retrograde aspects and fixed star conjunctions show the areas of life, or the personality traits and behaviors, which specifically need extra development. The optimal Saturn nature is disciplined, responsible, stable, respectful and reliable. A healthy Saturn is hard-working and dedicated. The aim is to be physically and emotionally strong enough to endure the hardships of life, to take responsibility for yourself and your family. Natal Saturn retrograde could show as sadness, depression, loneliness, tiredness or lack of motivation. Disrespect of parents and authority figures may be holding you back. Whatever is stunting your productiveness is what Saturn retrograde focuses on. This could well have been an ongoing problem hindering success over many incarnations. Events or relationships will keep reinforcing the problem area this life, especially during Saturn retrograde phases, until you master it. Saturn retrograde in transit is a regular cycle occurring just over every twelve months, lasting about 4½ months, and spanning 6 or 7 degrees of the zodiac. Transiting Saturn retrograde can be a time of limitation, restriction, anxiety and fear. In recent months since Saturn entered the retrograde zone, you will have dealt with particular issues involving your duties and responsibilities as they relate to your dependents and career. Saturn retrograde suggests this area of responsibility is so important, extra time is needed to take stock and make sure everything in order before you continue. You may be tested to make sure you are ready to take on the extra responsibility. The lessons you learn might be hard but they will be valuable. On the other hand, it could be that a negative Saturn behaviors such as sadness or shyness has gotten out of control. In this case, the Saturn retrograde months will offer a chance to recognize and admit the problem. Things may get so out of control that an intervention or some drastic event must occur to shake you out of your depression or isolation. By the time Saturn stations direct, you should have come to terms with the relevant issues and be ready for the next phase. Focus and motivation leads to productiveness, achievement and recognition. Saturn stations retrograde on Monday April 29, 2019 at 20 ♑ 31. From now until Saturn direct on September 18 you learn your lessons. The chart and aspect grid below show a number of planetary aspects involving Saturn stationary retrograde. These aspects present some challenges but a positive influence comes from a star in the Tail of the Eagle. Fixed star Dheneb at 20 ♑ 03 gives kindness, charity, liberality, the ability to command, and success in war and martial arts. Constellation Aquila gives great imagination, strong passions, indomitable will, a dominating character, influence over others, clairvoyance, a keen penetrating mind and ability for chemical research. The Eagle rules the U.S.A., space exploration, bombs and missiles. 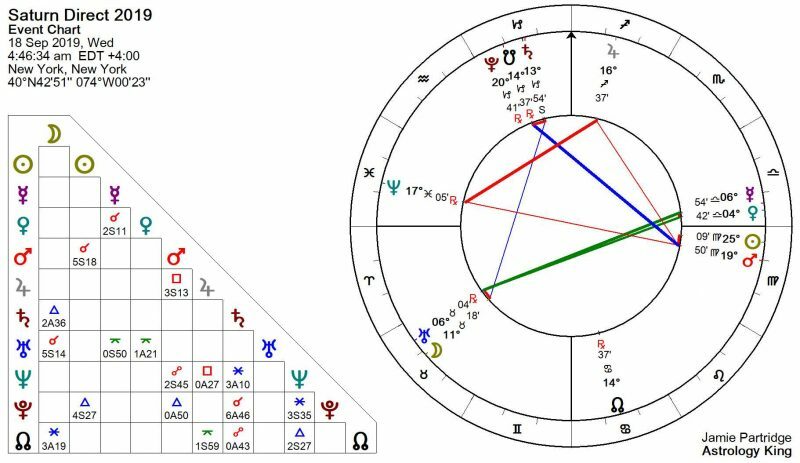 Mercury square Saturn means the Saturn Retrograde 2019 lessons involve your thoughts and words. Communicating your plans and ideas could become difficult because of negative thinking and misunderstandings. Lack of patience and concentration means it is easy to become distracted. Do not rely on the words of others, and be careful with your own. When negotiating, doing business, studying or making decisions, pay attention to detail. Indecision and procrastination are also possible. While Saturn is stationary retrograde in particular (April 25 to May 2), seek trusted or professional advice if involved in contract, business or legal matters . Saturn retrograde 2019 will be especially challenging if you have a history of teasing or verbally abusing people. Gloomy thoughts, bad news or loneliness could have a negative effect on your mental well-being. You may experience some distance or separation in close relationships. If so, it would be the karmic result of using your thoughts and words to make another person feel bad about themselves. Mars quincunx Saturn brings tension between your sense of responsibility and your desire to fulfill your own needs and do what you want. This can bring indecision and procrastination. You may become irritable and resentful, blaming someone else. But it is also possible for someone to discourage you from doing your own thing. Perhaps a man in your life is a negative influence and damaging your self-esteem. Avoid burying your anger and instead control your aggression and make constructive use of it. Saturn sextile Neptune brings material gain from spiritual pursuits. You can make your dreams come true with hard work and a sensible, realistic approach. You will understand your own limitations but will be optimistic at the same time. You will also gain a deeper understanding of your spiritual goals and how they fit into the bigger picture. Spiritual wisdom brings the patience and self-discipline to sacrifice short-term gratification for long-term success. You can also help make other people’s dream come true now through practical help and through spiritual support and encouragement. Devotion and service to others will increase your spiritual awareness and understanding. Saturn conjunct Pluto means hard work and serious business. You will need patience and determination as you face extra responsibilities with less time and resources to get the job done. You may experience loss, hardship or disappointment as you learn what it is that you must let go of or change. If something is broken you must fix it or throw it out. Immoral or unethical behavior such as lying, manipulation or breaking the law would have serious consequences and further restrict your options and freedom. This is a time for deliberate, well-considered change. This is a slow, evolutionary process that builds new foundations on which to prosper in coming years. Saturn conjunct South Node suggests destiny encounters or fated event will guide you on the right path for your soul. They will help you let go of limiting conditions and bad habits. You can then incorporate new people, projects and more positive behaviors into your life. Saturn stations direct on Wednesday September 18, 2019 at 13 ♑ 54. In this direct phase you put into practice what you have learned. The outlook is much brighter and suggests that the Saturn retrograde lessons have been well learned. There are only positive aspects to Saturn stationary direct and it is exactly conjunct a very fortunate fixed star. Fixed star Ascella at 13 ♑ 54 gives good fortune, happiness and a religious mind. It makes people thoughtful and philosophical with the ability to write on religious or similar subjects. Moon trine Saturn gives the patience and emotional strength to handle sensitive or difficult relationship issues. Others may come to you for advice on a personal issue or just for a shoulder to cry on. Traditional values and old habits can bring solutions to new problems. You can rely on strong instincts and common sense to make important decisions about your home, family and relationships. Your memories and dreams will also guide your feelings on any subject. Much self personal develop would come from consulting a psychologist or past life therapist. Highlight the word ‘you’ in this article. 96 times no less (including ads) If YOU are not saturated with guilt and shame by the time YOU finish reading, welll..